Enchilada are not just for meat.No Meat WOW!in this recipe sorry meat lovers. 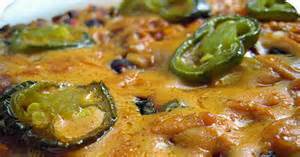 The following recipes is a delicious no meat version of the Mexican casserole. This delicious vegetarian enchilada casserole recipe uses beans as a protein and texture like meat. A wonderful and fun recipe for parties and office potlucks, this vegetarian enchilada dish is sure to please a crowd always. These Enchiladas can be served topped with guacamole and sour cream. In a medium sauce pan, heat oil over medium-high heat. Add vegetables and cook until slightly softened, about 5 minutes. Reduce heat to low, simmering sauce until it thickens, about 20 minutes. Heat oil in a large skillet over medium-high heat. Sautee onion until translucent, about 2 minutes. Add zucchini and sauté for about 5 minutes more, until it becomes soft. Add bell pepper, oregano, cumin, coriander and thyme. stir and sauté for about 3 more minutes. Add beans and corn and sauce. Mix and heat thoroughly. Arrange half of the soft tortillas on the bottom of a lightly greased 9 by 13 inch glass or enamel casserole dish. Spoon half of the sauce mixture on top of the tortillas, and sprinkle half of the grated cheese on top. Repeat laying process one more time with tortillas, sauce and cheese. Bake for about 20 minutes, until the top is bubbling and cheese slightly brown.